If you plan on printing and making round badges from the Happy Saints eBooks, a hole puncher will be very helpful indeed. The badges in the ebooks are 2.5 inch in diameter if you print them at 100% size. 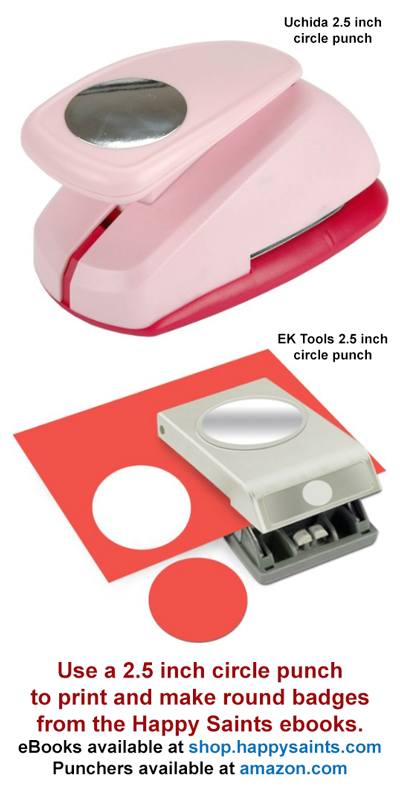 Here are some 2.5 inch circle punches you can buy from Amazon. Product links are below the image. You can also consider fancier types, such as those with scalloped edges. Disclosure: I do not have affiliate links for the links below. I personally own the Uchida punch and find it very good. I saw the pinterest post (http://www.catholicicing.com/easy-cupcakes-for-all-saints-day-party/) in which she made cupcake decorations with the saints. Im planning a all saints event at my parish with the confirmation classes and would like to make cupcake decorations just like these. Which book should I purchase? I am buying the Happy Saints Activity eBook, are they included on that book?